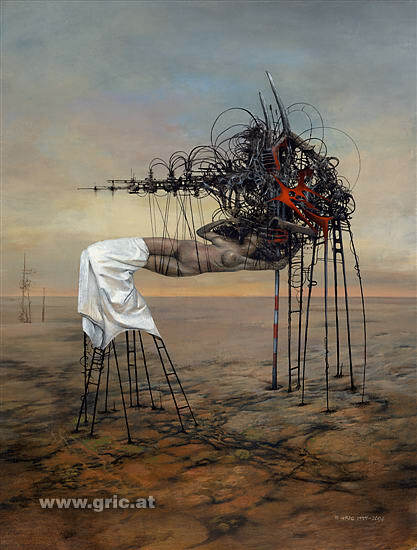 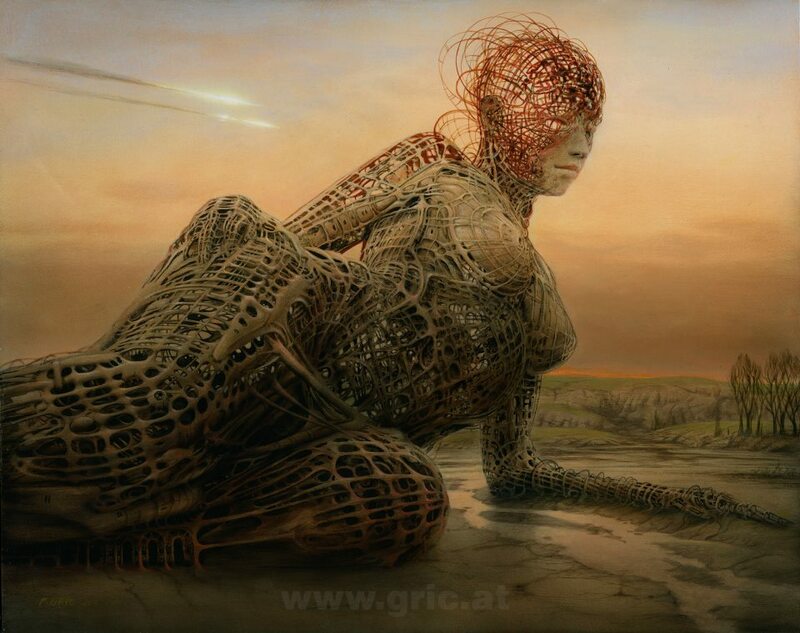 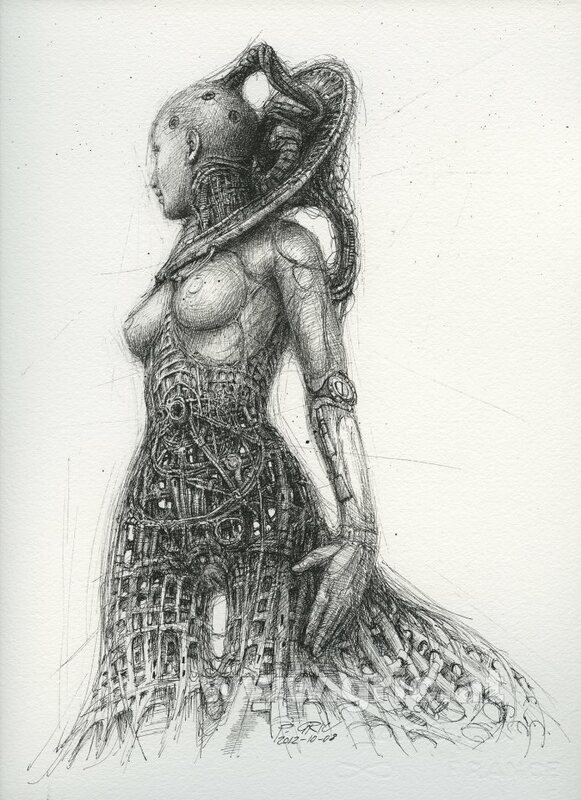 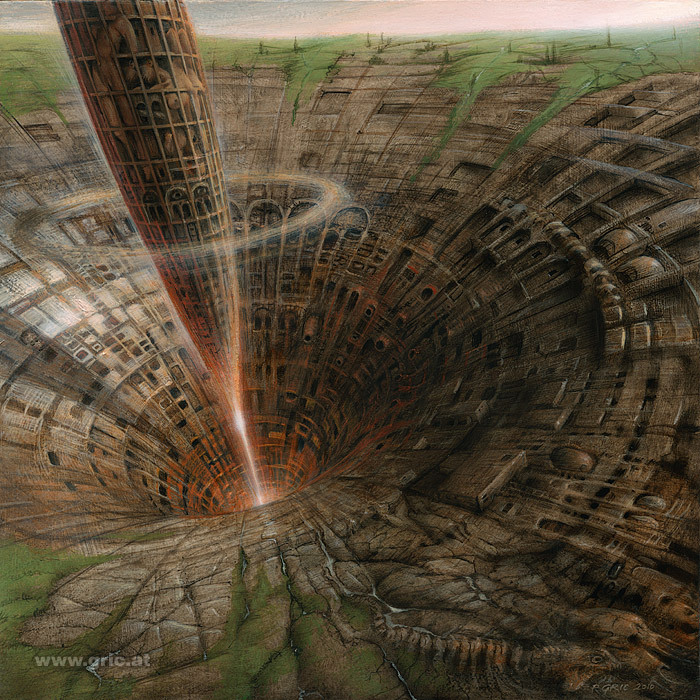 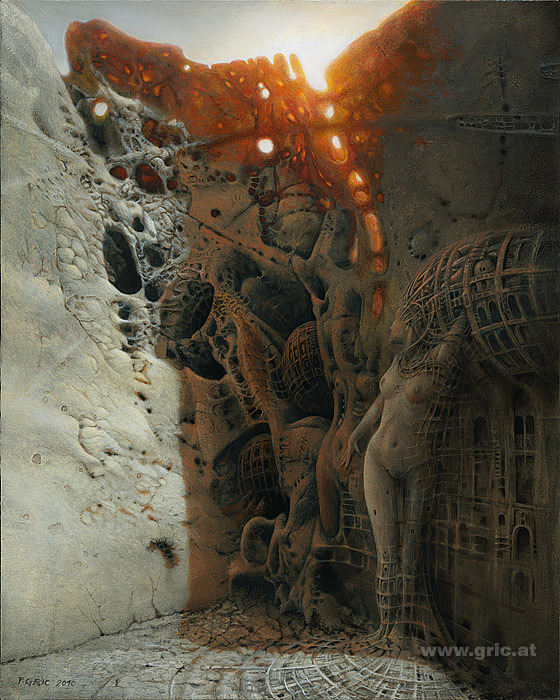 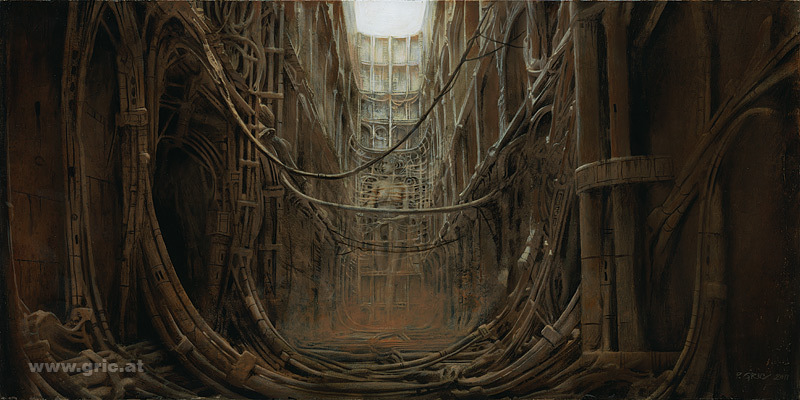 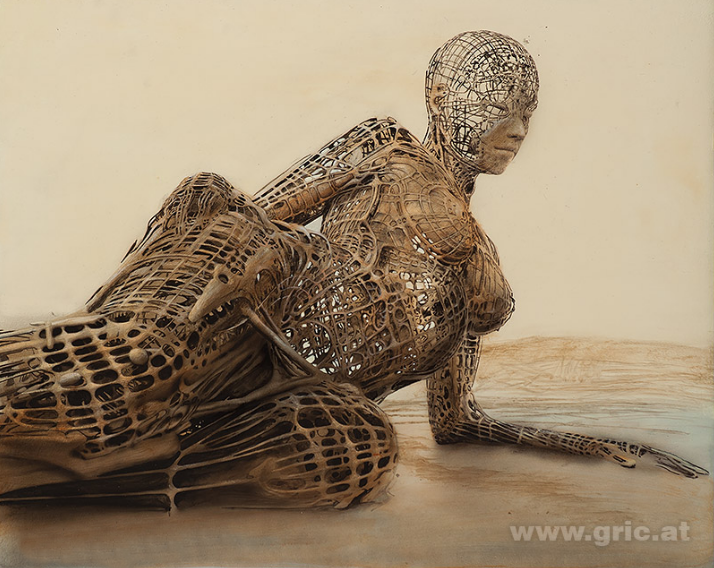 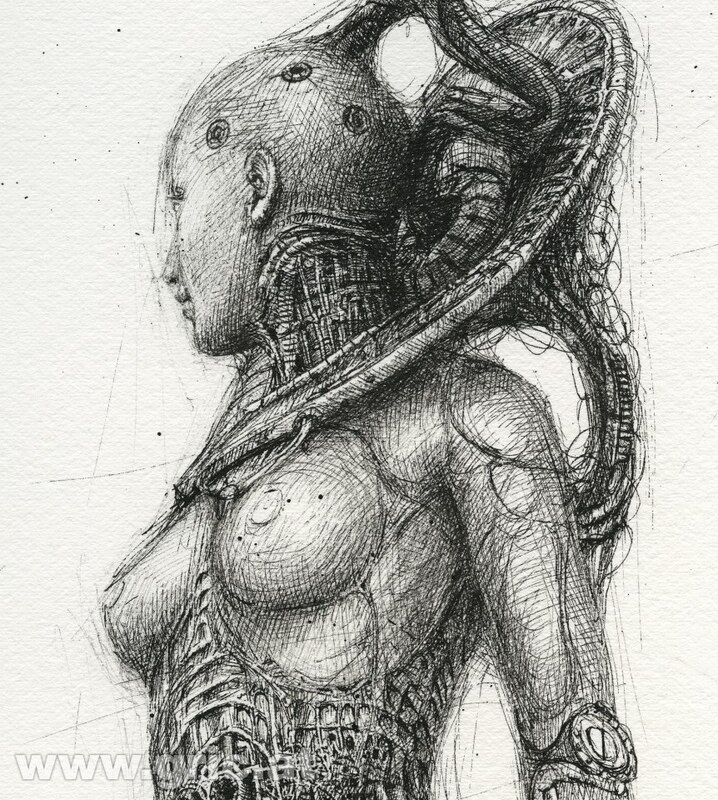 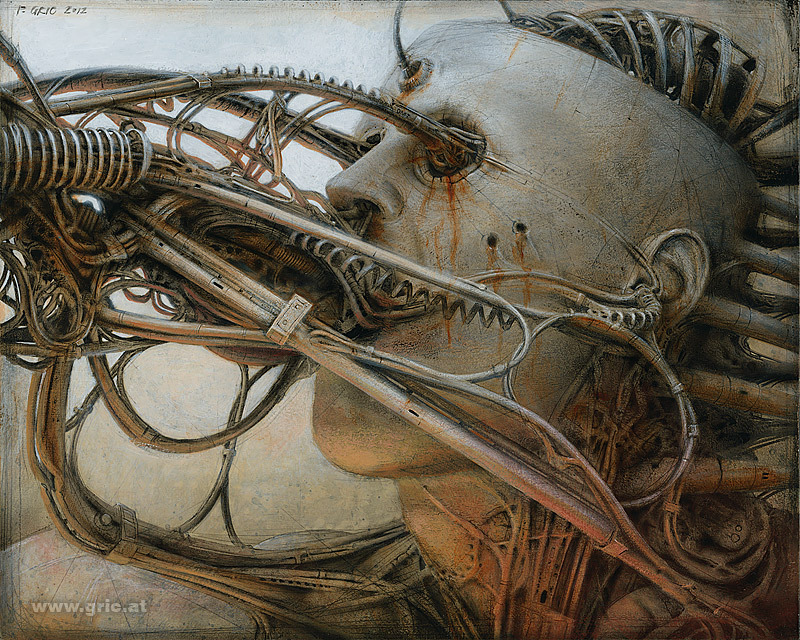 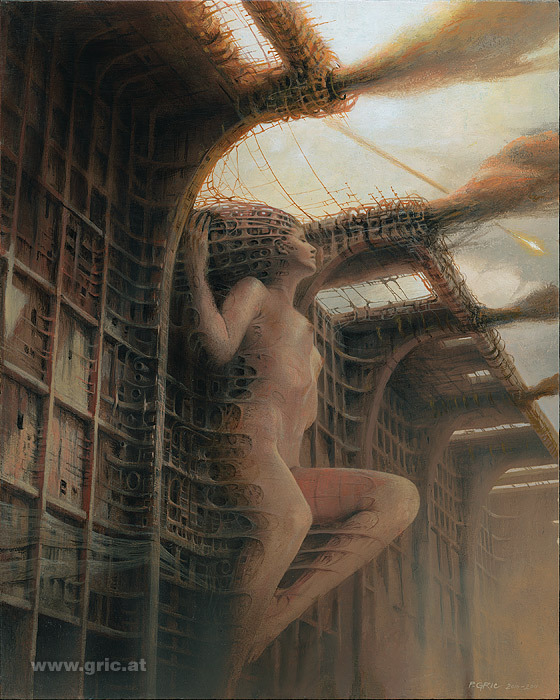 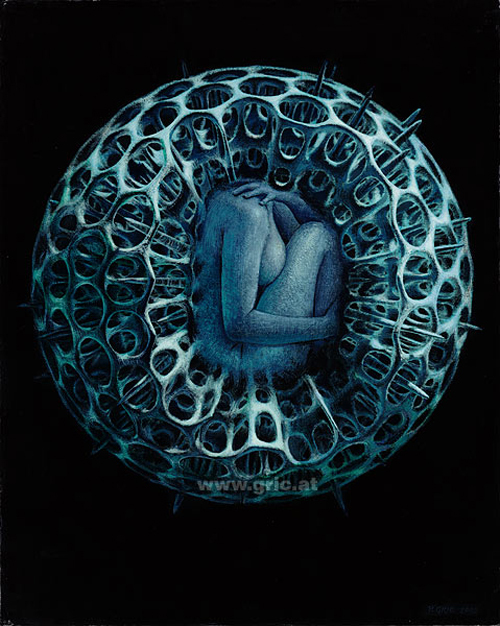 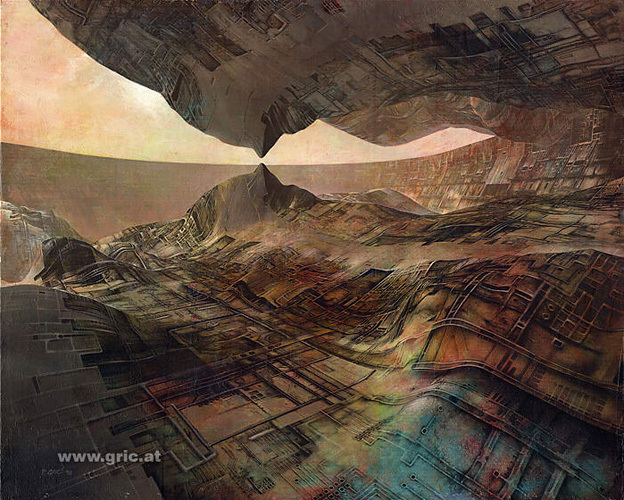 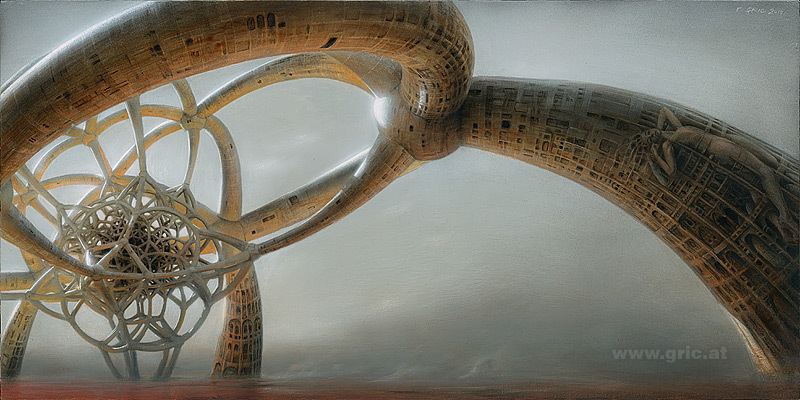 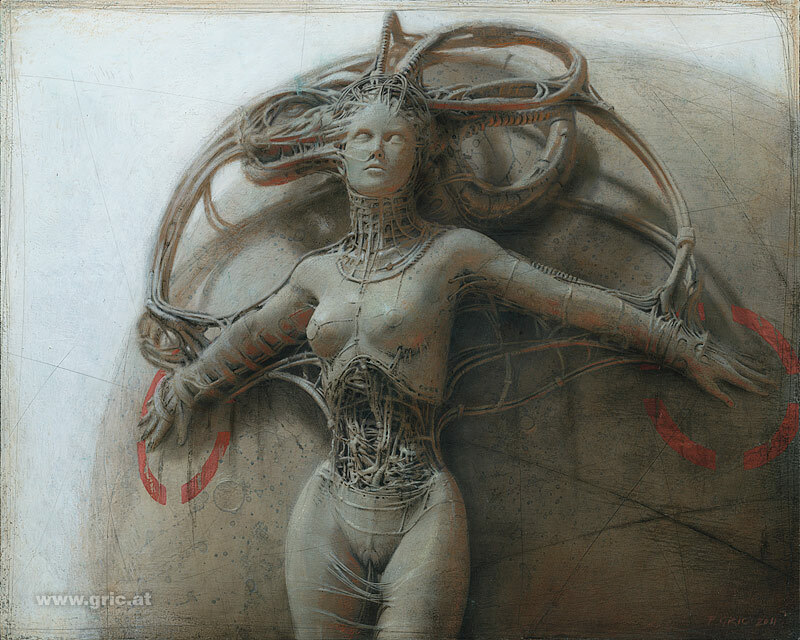 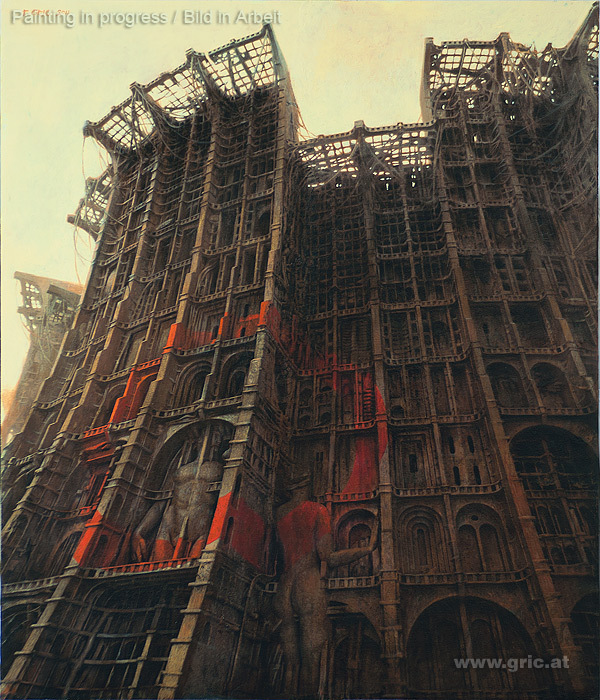 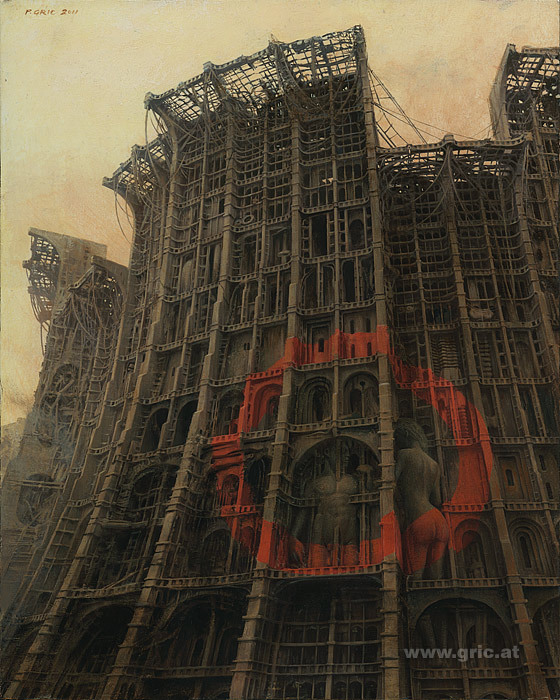 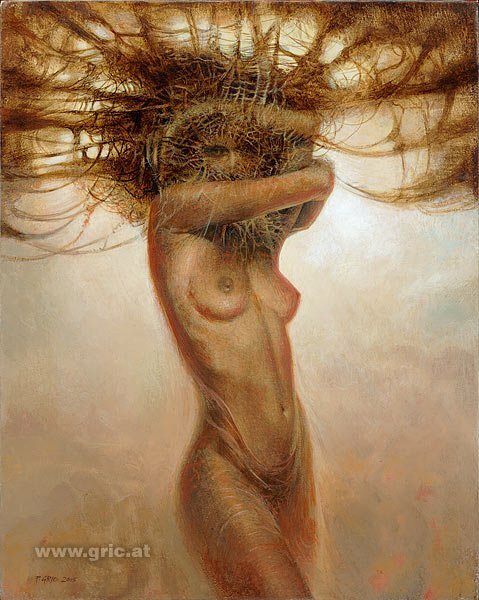 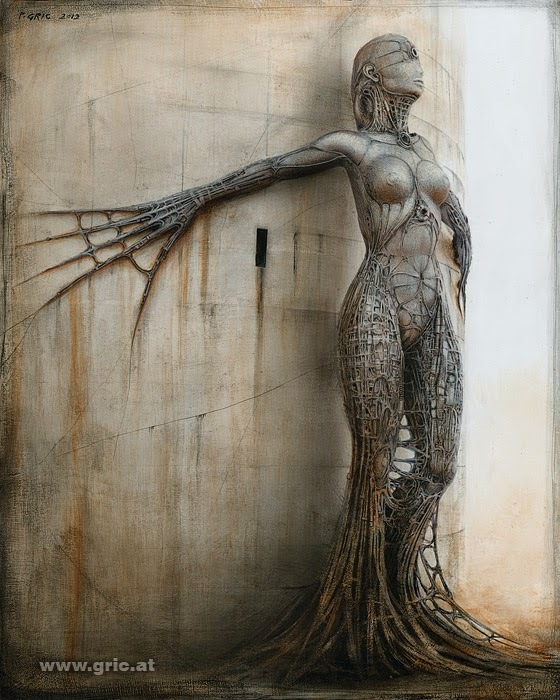 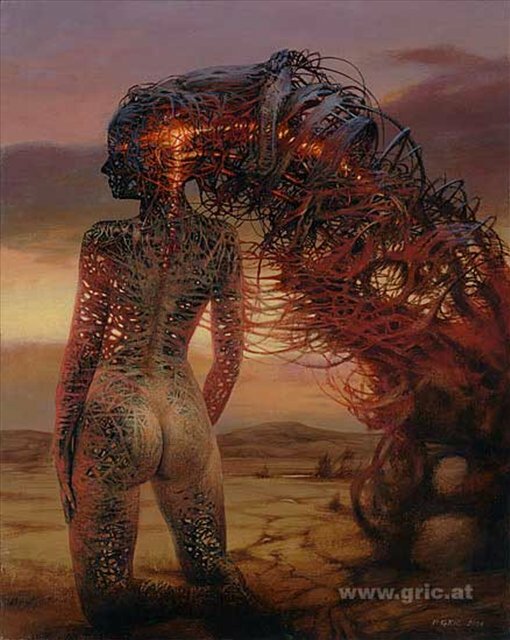 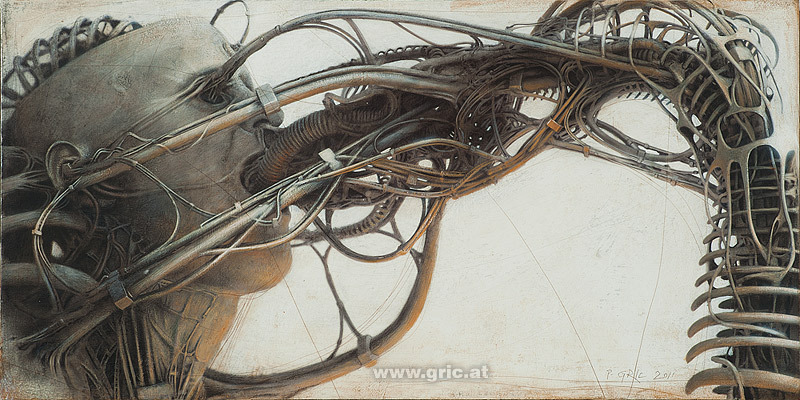 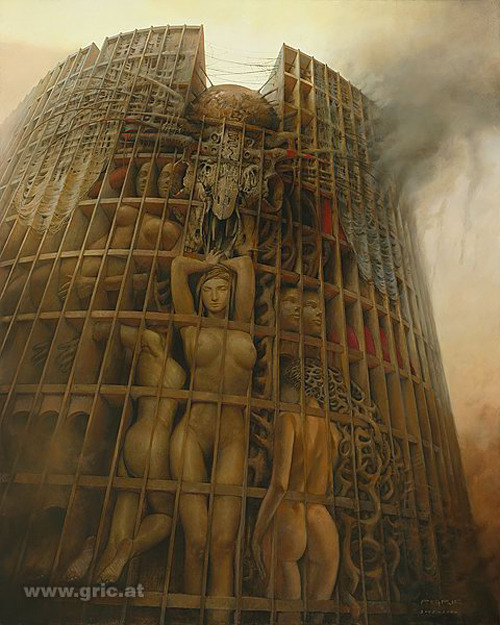 Peter Gric was born in Brno, Czechoslovakia and since the 80′s has been living in Austria. 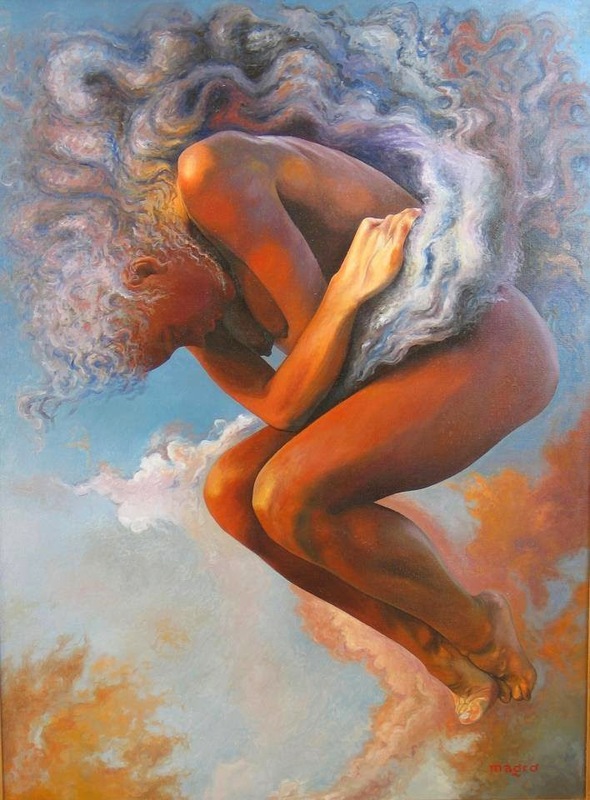 He has been painting and exhibiting for the past 20 years at home and abroad. 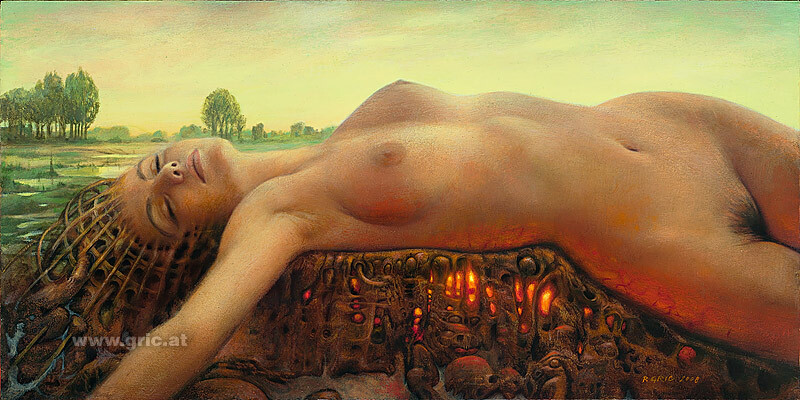 He studied under professor Arik Brauer at the Academy of Fine Arts Vienna who was one of the original members of the Vienna School of Fantastic Realism. 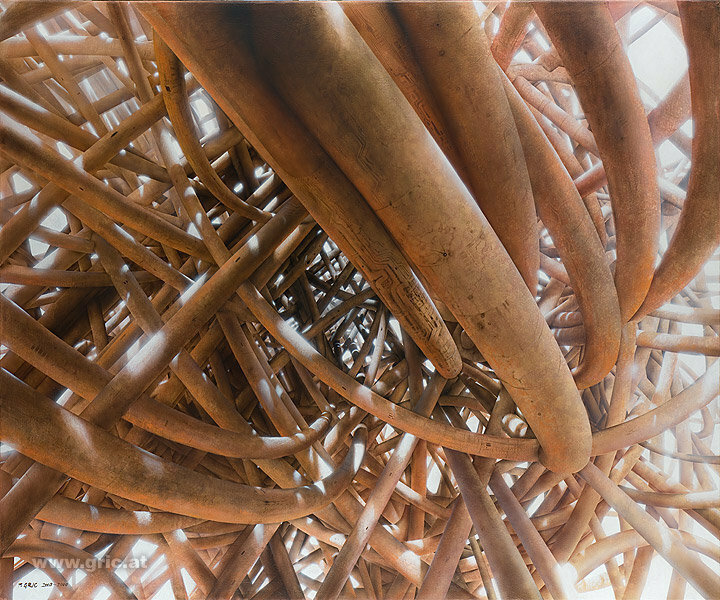 Peter therefore is among the next generation of artists influenced from this movement. 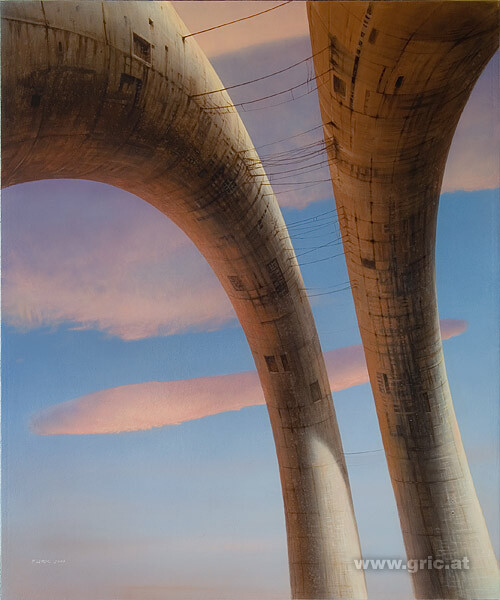 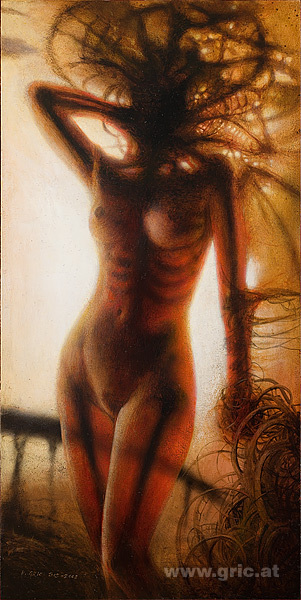 He completed his studies in 1993 with a Masters degree in Fine Arts. 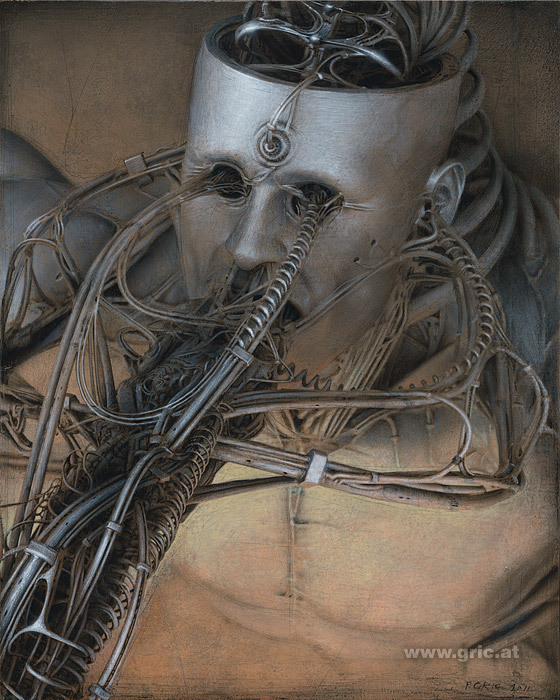 Peter has been exhibited alongside other notable artists such as H. R. Giger and is a member of the Labyrinthe Gesellschaft. 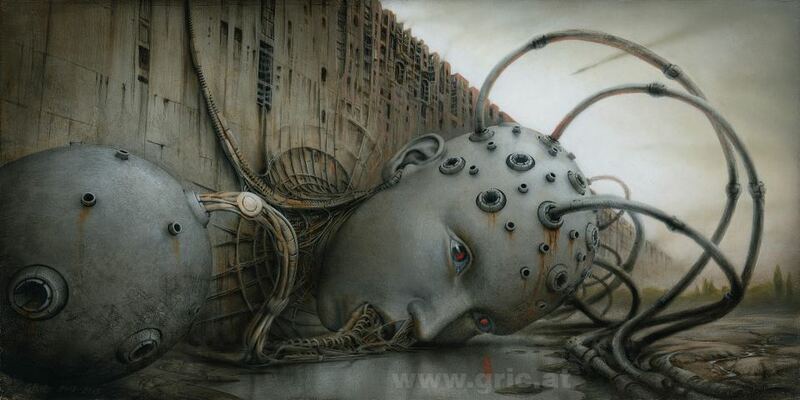 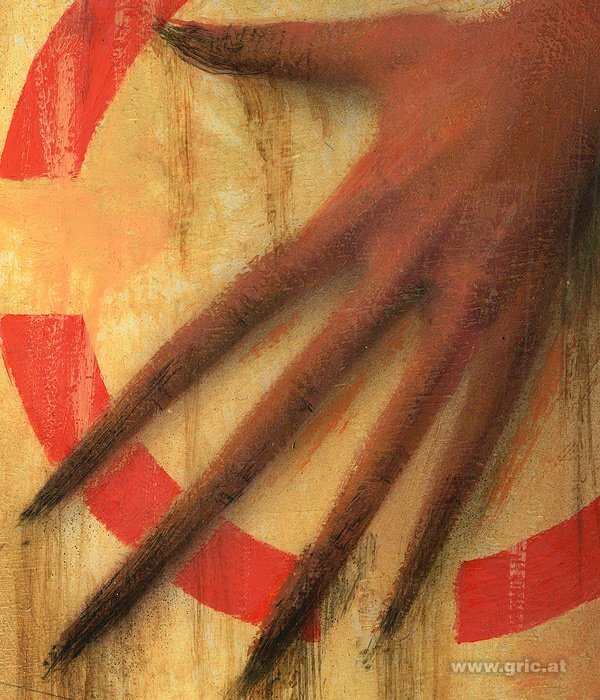 He has illustrated numerous book covers, predominantly for sci-fi or fantasy genres. 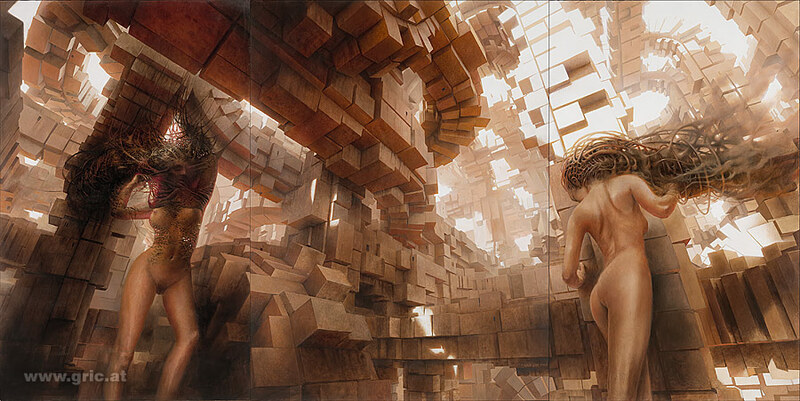 Being of a younger generation of artists, he has not shied from digital technology and also worked in 3D modeling. 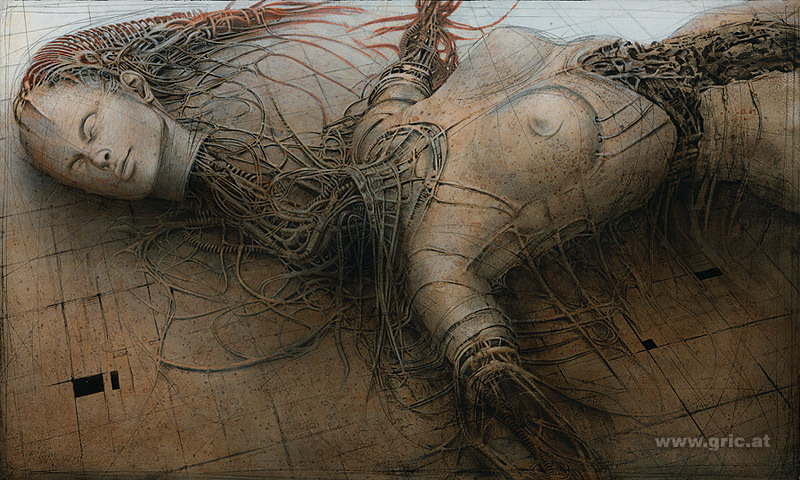 This has been used by him to visualize some of his more complex works before being committed to paint. 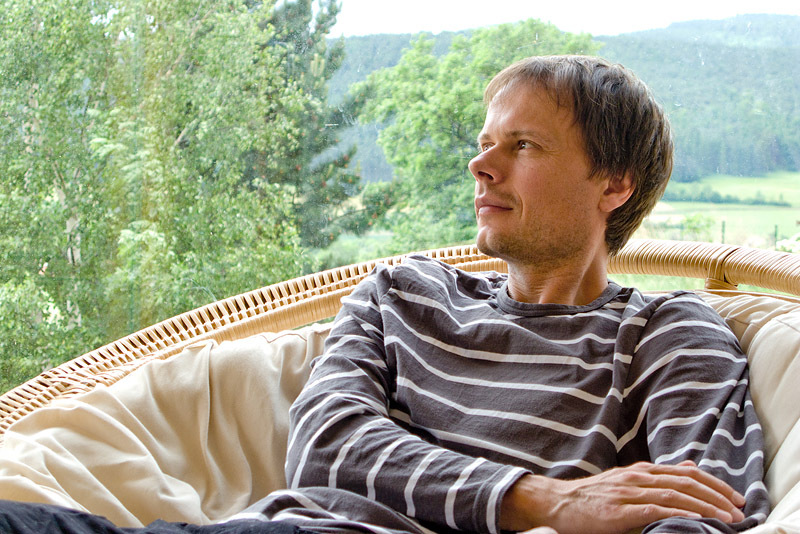 In 2007, Peter commenced a stage design for the SamPlay production “Hamlet in Rock”. 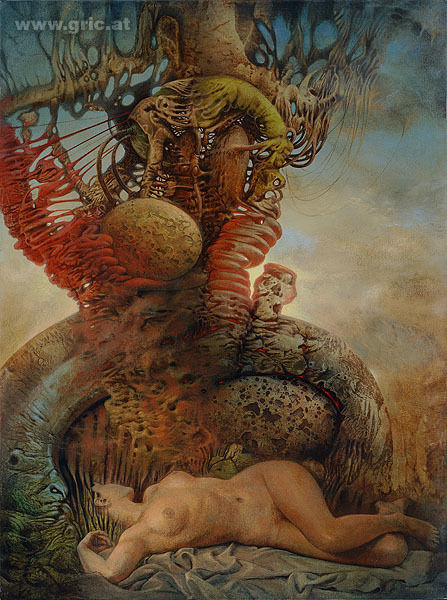 That same year, Peter’s work appeared in an international publication, “Metamorphosis – 50 Contemporary Surreal, Fantastic and Visionary Artists” (ISBN 978-0-9803231-0-8). 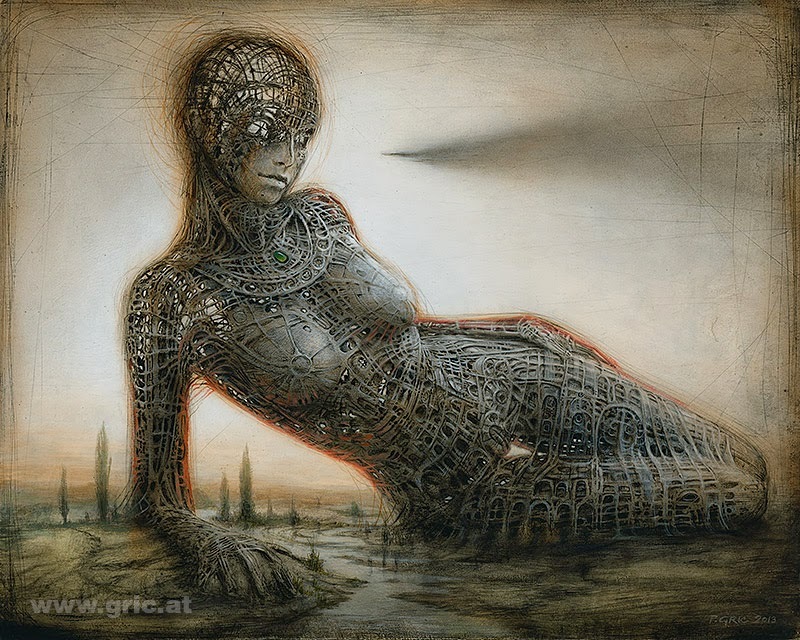 He has since exhibited with Galerie 10, which has had a long association with the founders of Vienna Fantastic Realists, such as Ernst Fuchs, Wolfgang Hutter, and Arik Brauer, whom he studied under. 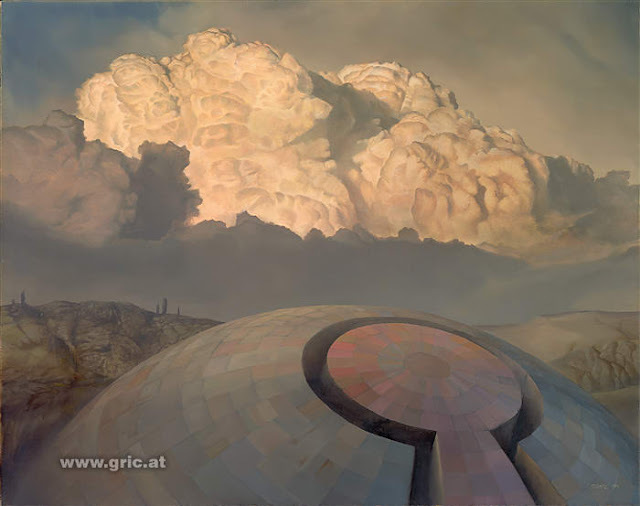 He was also invited to join the Ange Exquis, an international group project organized by his fellow countryman and painter Lukáš Kándl. 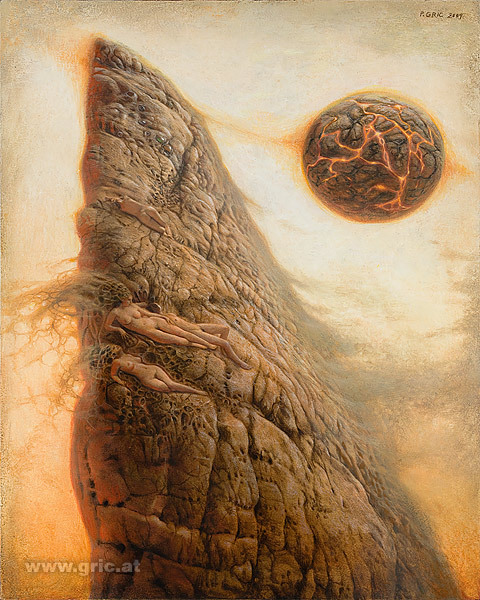 Project members add and remove artworks from the collective body of work over time. 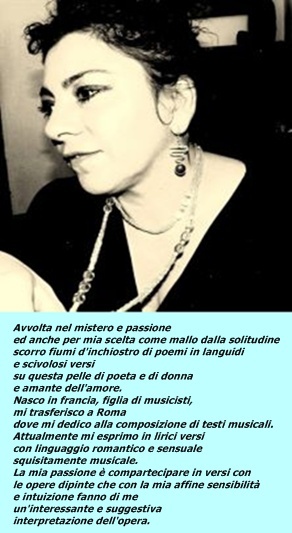 Gric’s artwork has been acquired by many private and public collectors, among them also the Austrian Gallery in the Belvedere (palace) in Vienna, and film director Guillermo Del Toro.